Gothique - ZineWiki - the history and culture of zines, independent media and the small press. 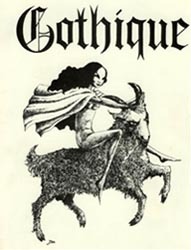 Gothique was a fantasy and horror fanzine. The first issue was published in July 1965 in the UK. A special issue of Gothique was part of the Thirdmancon Combozine (April 1968), which also included special issues of Badinage, Scottishe, and Speculation. The last regular release was issue 9, published in October 1969. By this point the remaining editors were David Griffiths and Stan Nicholls. The last issue, #10, was published in an extremely limited run of 40 copies in March 1970, until the Special Anniversary Issue appeared in July 1985. The editors simultaneously releasing the science fiction fanzine Stardock from 1968 till 1970. Contributing writers included Mike Ashley, Juliette Bentley, Eddy C. Bertin (later editor of Dunwich Dreams), Ivan Butler, Bruton Connors, John Derry, Alan Dodd (Camber), Ray Fawcett, Maxwell Hogarth, Ted Isaacs, Robin James, Russ Jones, Harold Jordan, Tony Lines, Luna Mora, Michel Parry, David Soren, Tim Stout, Henry Stralson, David Sutton, Keith A. Walker, Martin Walsh, Bob Webb, Fredric Wertham, MD, Kevin J. Wheelan, and the editors. Covers were by David Griffiths (#1, #2, #3), Moy Read (#4, #7, #10), Brian J. Frost (#5, #8), Robin James (as "Jess") (#6), Brian Pugh (#9). The cover for the Thirdmancon Combozine issue was by David Britton. This page was last modified on 3 June 2012, at 18:40.